The Messermeister Meridian Elité knife collection defines tradition with a triple rivet, full-exposed tang handle. These knives are one-piece, hot-drop hammer forged from a single billet of the finest German stainless steel alloy and fitted with the most durable industrial strength, ergonomic handle in the world. Meridian Elité knives are handcrafted and polished one at a time using the same techniques that have been the hallmark of fine Solingen-made cutlery that have stood the test of time. Meridian Elité knives are the authentically superior, forged and triple-riveted knives manufactured in Solingen, Germany. Just as versatile as a traditional Chef’s Knife, a Santoku Knife is also known as a Japanese Chef’s Knife. 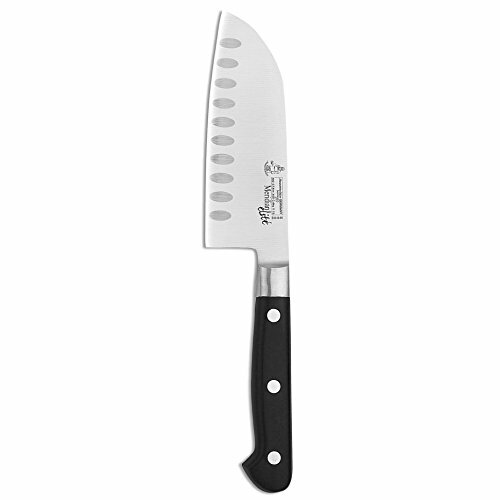 The Meridian Elité 5” Kullenschliff Santoku, has a thin taper for maximum precision when slicing vegetables, fish and meat. The kullens which are the semi-circular hollows on either side of the blade, reduce adhesion and ease the cutting and separation of meats, cheese and vegetables. The blade and handle are compatible in width and weight, resulting in a well-balanced knife.